Whilst relatively new to the nail scene, Magpie seem to be really on the ball right now, bringing out exactly what nail fans are after. 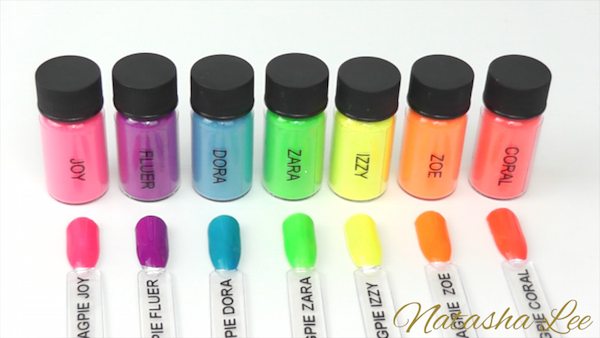 Their latest product range which went live last night, are the Magpie Neon Nail Pigments, and they really are something to behold! I was lucky enough to get my hands on them before release which gave me a chance to really play with them and find out what I thought. I’ve included my review, directions on application and a comparison with the Lecenté neon powders in both my blog and video below. 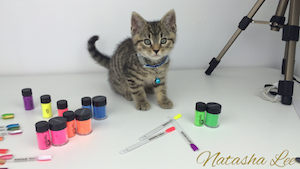 In the set of Magpie neon nail pigments there are 7 fantastic colours. If you are wanting that true, unadulterated opaque neon, then you simply apply the pigments over a white nail polish – ideally gel polish. If however, you fancy mixing it up a bit, then you can try the neons over any nail polish colour. I thought the best way to demonstrate the Magpie neon nail pigments, was to apply each pigment over a white, silver and gold gel polish. 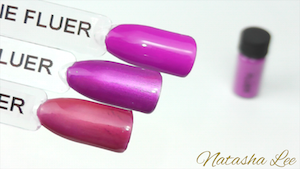 You can use these with normal nail polish, but gel polish has a sticky layer after curing which is perfect for applying things like pigments and glitters to. You can also use these pigments either mixed in with polish, or mixed in with gels and acrylic powders. Check your product manufacturers instruction before trying this, but the normal ratio is 1⁄3 pigment/glitter and 2⁄3 polish/acrylic powder. 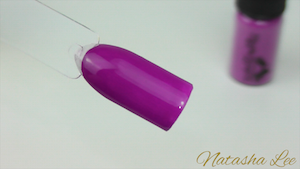 “Joy” is a neon pink pigment, and in the picture to the left, the top nail pop is Joy over ‘Extreme White’ Gel II. The middle pop is over ‘Metallic’ a silver Gel II and the bottom pop is neon over ‘Grande Affair’, a yellow/gold Gel II. 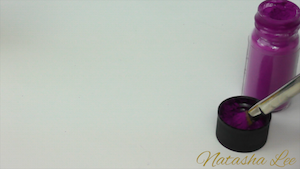 “Fluer” is a rich purple/violet Magpie neon pigment that has amazing depth and looks even more amazing over silver that it does over white! “Dora” is a neon cerulean sea blue. This is another one of the colours that really comes alive over a silver, but looks equally as impressive as an opaque cream neon. “Zara” is a bright neon green, which over silver and gold takes on the appearance of different shades of metallic lime. “Izzy” is a fabulous pale yet super bright neon yellow. Over white it’s a perfect true neon, whilst over silver it becomes a bright lemon neon, and over gold it has a beautiful neon-sunshine quality. 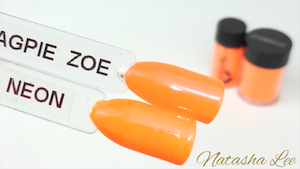 “Zoe” it a super bright neon orange, again with fantastic coverage. Whilst applying it over silver makes a gorgeous pearlescent orange, applying it over gold produces a gorgeous mediterranean style burnt orange. Finally, “Coral” is an amazing neon red/orange/peach which is super hot! When it’s applied on white it is THE perfect holiday colour, however, when applied over silver it produces an amazing cerise/magenta shimmer. I know that there’s a lot of professional nail technicians like me out there who have been using the Lecenté neon powders since they were released. However, there have been some teething issues with getting a good even application. 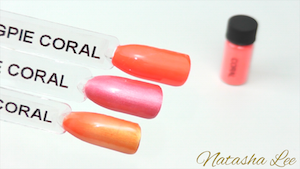 When I was a CND Shellac Education Ambassador, I used to produce Lecenté’s YouTube tutorials for them – including the video on how to use the Lecenté neon pigments, so it was in my best interests to find the perfect way to apply them. I was interested when the Magpie neon nail pigments popped through my door, to compare them to the Lecenté. I thought I would compare colours first (Lecenté has 5 colours, Magpie has 7 so I have not compared “Fluer” and “Coral”) and then application and costs. Comparing Lecenté Snakebite and Magpie Joy side by side, there was a slight colour difference. Joy appears to have a deeper and more even coverage. Snakebite is a lighter/brighter neon, but appears slightly more patchy when looked at close up. 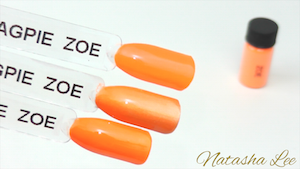 There wasn’t much different in the actual colour tone between Magpie’s Zoe and Lecenté’s Day Glo, but again it was evident that the coverage with Magpie was richer and less patchy than Lecenté’s neon orange Day Glo. Side by side there’s quite a big difference between Magpie’s Dora and Lecenté’s Hip Hop. 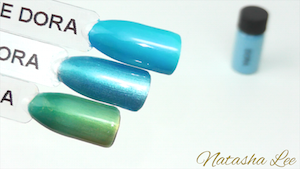 I had previously found the green and blue neon pigments from Lecenté the most temperamental to work with and this was very evident comparing the two brands side by side. Magpie’s neon blue is more of a neon cerulean blue, and Lecenté’s is more of a neon pacific blue. As mentioned above, the green and blue neon pigments from Lecenté were traditionally the most finicky to work with – patchy coverage being the main issue. The photo/video didn’t really pick this up well, but with the green Lecenté neon powder, any slight inconsistencies in the application show up as darker green areas, almost like a mottled affect. However, the Magpie neon green pigment was also slightly imperfect showing up some light brush strokes when examined very closely. The neon yellow pigment powders from Lecenté and Magpie are very similar in coverage with both producing a nice even finish. The only difference was the tone, which under the naked eye shows up as Magpie Izzy being more of a true bright neon yellow, and Lecenté’s Graffiti is just slightly more subtle in it’s tone. As much as I loved the Lecenté neons when they were first released, I have to confess that Magpie neons absolutely blow them out of the water for coverage and ease of application. The Lecenté neons are chalky, have a tendency to clump and are just more temperamental when it comes to getting a good application. The Magpie neons are a dream to work with and are generally fool proof meaning that you don’t get any patchiness or brush streaking. It also means that they apply really quickly and easily so you only add a couple of minutes to your manicure. They also give a fantastically deep coverage which makes them look like an actual polish colour as opposed to a pigment over a polish. Lecenté come in pots of 4.5g which are £8.34 including VAT. Magpie come in jars of 4g and are £4.50 including VAT. The price per gram works out therefor at £1.85 for Lecenté and £1.12 for Magpie. So despite Magpie coming in smaller jars, they are considerable cheaper per gram than Lecenté neons. 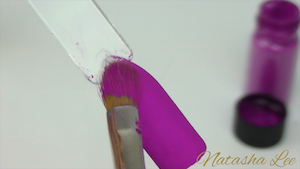 Once you have applied 2 coats of white in your chosen brand and cured each layer, decant a little of the magpie neon nail pigment into the lid of the jar. 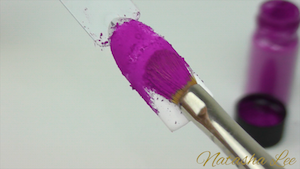 Using a suitable gel brush, (I find this the best one for glitters and pigments) pat both sides of your brush onto the neon pigment loading up the brush. Pat your brush over the whole nail – turning the brush over when you need more pigment – to fully cover all the white. Once you have covered the whole nail, clean your brush on a dry pad, then lightly brush off any excess pigment powder. 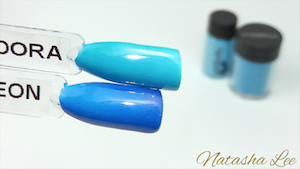 Apply top coat over the whole nail, make sure to cover all of the pigmented areas with top coat otherwise when you clean the nail you will end up with white areas wherever you failed to top coat. This most frequently occurs around the cuticles and side walls. Once fully covered, cure the top coat for the recommended amount of time. 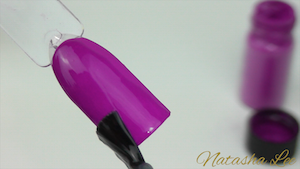 Once cured, removed sticky top film (if necessary) and you have your perfect Magpie neon nail pigments! I just know that once I take these into to my salon that they are going to be hugely popular!